Remodeling, especially room additions, often changes the use of existing household features. What was once a door may now be better repurposed as a window. Changing this feature is complicated and may require professional help. Make sure it's legal to replace your door with a window. Exterior doors may not be changed if they are also an important exit. Check building codes in your area before changing an exterior door. 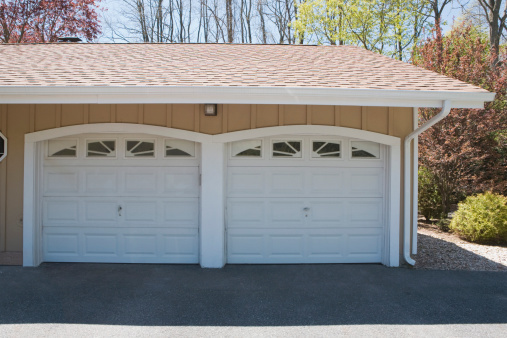 Also, if your neighborhood is under the supervision of a homeowner's association, be certain exterior changes do not violate the terms of your association's guidelines. Remove the existing door. The existing door and its frame must be removed first. Doors frames are generally not load bearing and can be safely removed. Decide on the size of the new window. The size of your window is dependant upon the structures surrounding it. You can make your window larger than your former door if making changes does not disrupt any load-bearing supports. In many homes a horizontal load-bearing support sits just above doorways. It's simplest to design your window to be no taller than your doorframe. To determine how much horizontal space you have for your window look for load-bearing supports. Load-bearing supports are usually identified by their size. They are generally made with lumber that is 4" x 4" or 4"x 6." Do not disrupt load-bearing supports without the help of a professional. To save costs find out what standard window sizes are available at your local home-improvement store. Non-standard sizes will be much more expensive. Build a frame for your new window. Once you have decided on the desired size of your window, create a frame to anchor your new window. Order a window of the appropriate size. Do not order or buy a window until your frame is done to insure a good fit. Install your window following the manufactures instructions. Although you cannot see it in a finished house, windows have a lip around them that seals around the opening. In addition, a special tape is applied around that lip to secure a tight seal. Windows will only open from one side. Make sure they are facing the correct direction when you install them. Finish your window. The lip around a window is generally concealed behind wooden trim or drywall. Garnet Greene has written professionally since 2004. Her expertise includes gems and jewelry, home improvement, gardening, cooking, decorating, fashion and entertainment. Greene writes for Answerbag, Daily Puppy, eHow, Firefox.org, Garden Guides, Garden Inspirations, So You Wanna, and the print magazine "Engagement 101." She has a bachelor's degree in English literature and is a formally trained screenwriter.